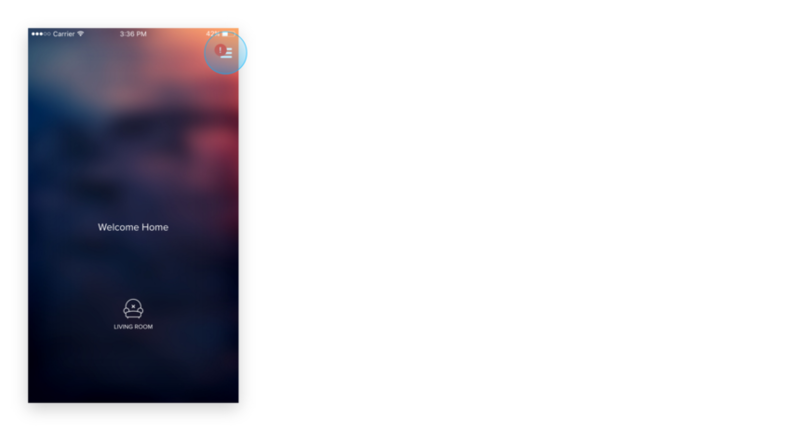 When we release an update, it may take a while until your NEEO Brain shows the notification. The reason for that is that we only check for updates when the NEEO Brain is rebooted or every couple of hours. In addition to that, it takes a bit to download the firmware in the background. During the update, the LED on your NEEO Brain will be blinking red, when the LED is solid white again the update is done. 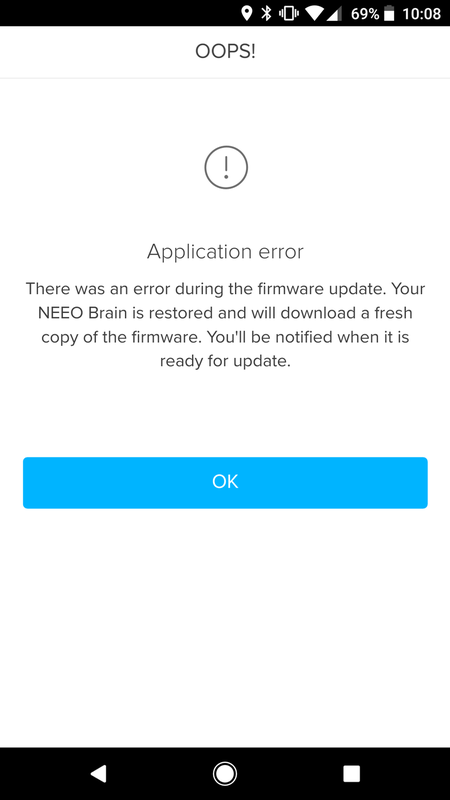 The NEEO Brain is always updated first, once that is done the NEEO Remote will recognize the update and start downloading the firmware from the NEEO Brain, this is indicated with a "down arrow" in the status bar on the NEEO Remote. 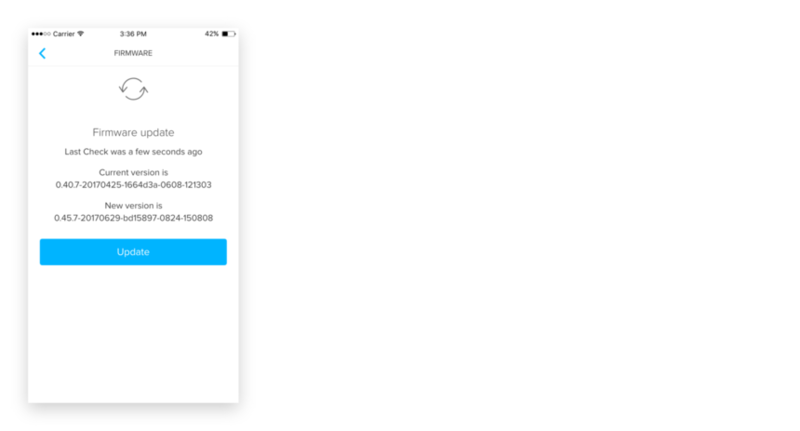 Once that is ready a popup will let you start the actual update of the NEEO Remote, from now on, just follow the instructions on the screen. Be aware: If the NEEO Remote is in the dock, it will automatically execute the update without you having to take any actions. Dave Overbaugh Yes, good catch. We have released it this morning . Sorry if this is not the right place for this, but I can't update the firmware. John Harding Reboot the brain by deplug the power cord and reboot it, thereafter this should work. If not, yust reply here. Josef Fruhmann Did you start the Update and get an error message, or did you just see the red mark on the menu button? if you see the mark, you must navigate to the update section, currently no auto update of the firmware is activated. If you see a fault massage or no update, try to reboot the brain and check again if it is working after the reboot. to reboot, just remove the power cord for a few seconds and replug the brain. Hello. Wie kann man bei der NEEO die Zeit oben einblenden? Ich finde keine Einstellungen. Alex Eigenmann Aktuell nicht möglich. Wird mit einer neuen Software kommen. Actuall not possible, will be added with a future Firmware Release. Mine appears to be stuck on 0.45. tried rebooting and it doesn't find the update. Brett seib is the Brain connected over wifi only? If so, can you try to reboot and check when a cable is used? How long did you wait after the reboot to check the update side? Brett seib Did the update work already? If not, could you provide your NEEO Host so we can check on our servers if your NEEO Brain has downloaded the latest release? You can find that in the about section in the settings on the NEEO App. I did get it working now. The reboot fixed it. I just didn't wait long enough. Thanks! Is it supposed to check for updates every few hours? Mine says it hasn't checked for 5 days, and it's connected to both ethernet and WiFi. Hi, I have now tried to update from 0.47 about 10 times (with or without ethernet cable connected). Sometimes it gets stuck blinking red and sometimes it finish normally. The only thing that it is always the same is that it still has version 0.47 afterwards. When I upgraded to 0.47 it worked on the third attempt. I'm completely out of ideas on this. Janne Engblom what kind of router do you use? and is there a firewall in between? Janne Engblom Hi, thank you for reporting this. Could you please post or send me your NEEO hostname which can be found in the about section? I will send it to our dev team. Meanwhile, could you try to reboot your brain? Could you please perform this speed test as you can find here and send me your results. Thank you very much. my router is an Inteno EG-300AC where I disconnected wifi and use Google Wifi instead. Janne Engblom Can you please try rebooting your router too? Reboot your router with your NEEO Brain unplugged from via ethernet and power. When your router is back online, power up the NEEO Brain and plug it in via ethernet too. Give it a few minutes and attempt the firmware update once more. Hi Jeff, did that and left it flashing red for about 8 hours. After that I rebooted and still 0.47. Can you see if the brain has tried to download the update? I am going to reach out to you via pm to provide you with some steps to try. I have a brain which will not update. It is stuck on 0.47.9 version. I've tried power cycling it as well as removing it from ethernet cable with no luck. I have also rebooted my WAP. My hostname is NEEO-48b4dfdf. Any ideas? Mark Rowe After trying numerous ways to make the download happen it finally did. Not sure if was something I did or if NEEO had a hand in making it happen. Daniel Schneiter NEEO should find updates over wifi. Daniel Schneiter The Update only gets presented, when the Software is fully downloaded to the brain and is also fine after checksum control. And the Brain only checks all 4 hours for an available Software. If you had issues over wifi, the most reason can be a corupted download with missing parts or soemthing like that. 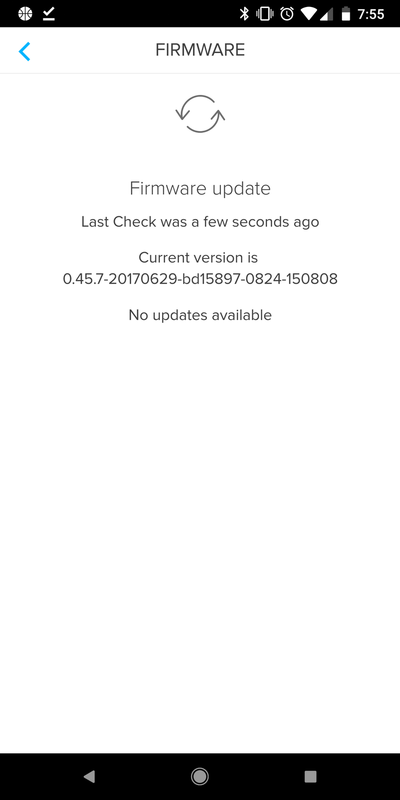 Daniel Schneiter Remember its your NEEO phone app that will let you know when an update is available for install. In the app you can then tell NEEO to start the update. Daniel Schneiter The Remote and brain communicate via WiFi and this also includes updates. Let me know if you are able to successfully update your NEEO Brain to 49.10. The remote will follow after. You would have to tap on "Install Now" on the remote. May take some time after the brain updates. My NEEO brain and remote is stuck on 0.47.9. I have rebooted the brain daily for the last week, reset it to factory and its permanently on LAN. Can I manually force an update? Renier Hugo Hello! Sorry to hear your NEEO has not updated since 0.47.9 😬. Can you provide me with your NEEOs Hostname, please? Can you plug a Ethernet cable into your NEEO Brain and router, open the NEEO app, tap on settings, tap on NEEO Brain and re-enter your WiFi credentials, please. After the hooray message unplug the Ethernet cable and reboot your router. Leave the router unplugged from power for about 45 seconds and then reconnect. When the router has rebooted unplug the NEEO Brain from power for about 2 min and then power it back up. Give it some time and let me know if you’re promoted with the firmware update. hi Jeff - My Neeo brain is on wifi and on LAN/ETH. My Neeo remote is on wifi and everything is working fine. I have reseted to factory just to ensure all was good. I am running a fairly extensive network in my house and due to the nature of my installation i cannot leave my 'router' unplugged. Why would anyone need to unplug a router if the network is 100% functional. I will run a full trace on the ethernet port where the Neeo is plugged to check if it attempts to get to the internet. My feedback is that this is not a user friendly setup even with someone that is at the most senior levels of IT. If this product is destined to gain market share - it needs to be a setup that a non-geek must be able to configure and use. I cannot recommend this to any of my clients or friends. Simple things like the mobile app on iphone - Neeo account login. With a fully fledged internet connection and the Neeo brain connected (lan and wifi) and functional - i can not login, can not reset a password - even creating a new account fails from the mobile device connected tot he same wifi. If there is special firewall configuration requirements, please let me know. I will alod send my Neeo device name when i get back home today. If you have a more elaborate networking setup with firewalls and routers, ensure that you have configured reachable NTP servers - failure to do so will cause the Neeo Cloud connectivity to fail, resulting in "Could not login"
Rebooting a firewall or core switch with the incorrect setup for NTP will result in the Neeo failing. The same issue with updating software will occur and firmware updates will fail for the same two reasons. Follow the steps above to remedy firmware issues.